History: (GLA#1 (fb) ) - The Ani-Men attacked the Milwaukee Convention Center on an animal rights crusade, blaming humans for everything from cosmetic testing to wearing fur. Model Ashley Crawford (Big Bertha of the Great Lakes Avengers) was at a modeling shoot there, and she phoned her teammates in the GLA for help. By the time the GLA arrived, they found themselves upstaged by the (real) Avengers, who made the GLA sit out on the sidelines so they didn't get hurt; the Avengers then defeated the Ani-Men. Comments: Created by Dan Slott and Paul Pelletier. A short profile, but they only appeared in 2 story panels, so whataya expect? No background was ever given on the individual characters, but we can assume that they have the abilities of the animals they are patterned after. Unlike previous versions of the Ani-Men, these Ani-Men seemed to be more concerned with protecting animal rights rather than just committing crimes. They could be human mutates (much like Count Nefaria's Ani-Men) who are connected with PETA or some other animal rights organization. 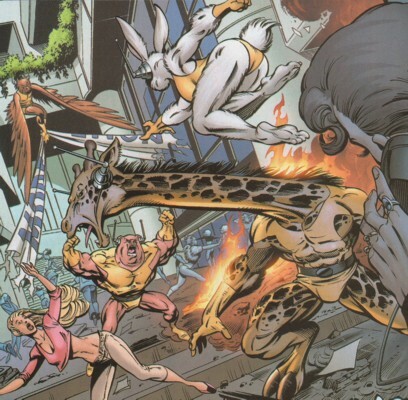 Or they may be actual animals that have been evolved/mutated (such as the High Evolutionary's New Men). Only time (and more appearances) will tell the true nature of this group.